I am experimenting with milk alternative again. Earlier this year, I fell in love with hemp milk. Right this moment, as if in a desperate attempt to hold on to summer as tightly as possible, I’m having fun with fresh corn milk. Corn milk is not at all a new idea. It has been marketed as an alternative to cow’s milk in Asia for a few years now. Corn milk in single-serving aseptic boxes was one of my refrigerator essentials this past summer when I was in Bangkok.Ice cold corn milk, made out of fresh raw corn, is a thing of beauty. With some honey and ground cinnamon added, it tastes almost like Horchata — only fresher and lighter. It can also be added to smoothies and shakes. I prefer my corn milk quite thick, so I use 1 cup of fresh spring water per one large ear of sweet corn which yields approximately 1 1/2 cups of corn milk. Adjust the amount of water according to your liking. Loving Cup turns this raw corn milk into a delicious cocktail! Oh wow, this sounds amazing! Especially with the spices. Bookmarking for next summer for sure! That’s interesting. This is the first I’ve heard of corn milk. And if it tastes like horchata, then it must be good. Sounds like a good drink to me. That sounds great. I’ve noticed the milkiness of raw corn, but I never knew it made a good drink. Having it with cinnamon and honey sounds perfect. 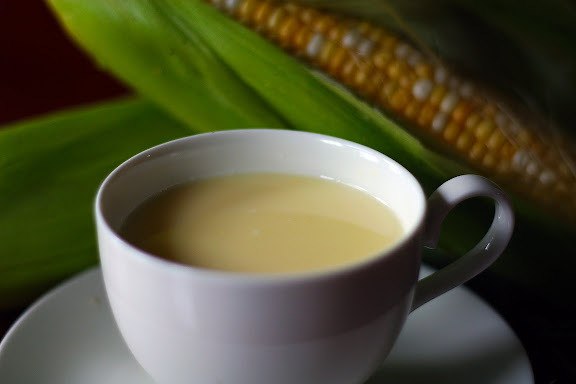 Iced cold corn milk sounds just delightful, especially with cinnamon and honey! Sounds delicious! I’m a soy milk fan, but I’d be happy to give corn milk a try. I’ve never heard of raw corn milk before. This is very interesting^^. Leave it to you to feature something once again unknown. You have a great knack for that, and it’s appreciated. This drink sounds so refreshing, I too want to cling to summer a bit longer, and this sounds perfect. BRILLIANT how come I havent thought of this nor heard of this – leela you did it again! my favorite thing to do when cutting corn off the cob is running the back of the knife a few times up and down the cob and then slurping up all that milky goodness. i can’t even imagine how decadent and lucious this “corn milk” could be! maybe it needs a new name though? i’ll be the marketing whiz behind that one! I bet using corn milk, along with the corn “meat” in a corn bread would make for corny goodness. And the corn horchata sounds awesome as well. Hey, how are you? I’ll just cut to the chase. Could you do a post on ‘Roti Sai Mai’? I had an idea, that if YOU made the Roti Sai Mai, it’d be amazing. The usual Roti they sell is too… ordinary. I think if you put extra stuff into the dough, it’ll be very tasty. And the sugar part? If YOU made up the ingredients, I’ll bet it’ll taste more than just ‘sweet’. I don’t know… I just had 10 of them in one sitting and thought there was room for improvement. So please… even if I don’t get to TASTE it, at least reading about ‘Roti de Leela’ would be good enough. I read your blogs. Still. How can I not? Where can I find a blog that actually smells and tastes like kitchen? I have an idea on how to make ‘Roti Sai Mai’ a big hit in the department stores. It’s a great idea that’s gonna make me a millionaire. But I need the reciepe first. The reciepe to the BEST tasting Roti dough and the BEST tasting sweet stuff that goes with the bread. The rest, I’ll take care of it. I’ll make it BIG! It’s gonna be a HUGE HIT! interesting. would like to try it. Is there a way to turn the corn milk into a corn based cheese? i Want to try this recipe cause a am a diary intolerent.. hope it works for me.. and i can add them in cakes to..